Hot tub and wet leisure product specialist Golden Coast has praised four loyal members of staff who have clocked up more than 50 years of service between them with the company. Sarah Huxtable, Lynne Walker, Emma Robinson and Andy Raymont have become the latest recipients of long-service awards from the Barnstaple-based company, which will be exhibiting at SPATEX at the end of the month at the Ricoh Arena, from January 29 to 31. With her 20 years at Golden Coast, Sarah Huxtable certainly deserves the long-service gratitude after being part of a lot of developments during the past two decades in the Admin Team where she carries out her secretarial duties and backs up other team members. This is truly demonstrated by her hard work, enthusiasm and dedication to the company. Lynne Walker, another member of the company’s busy and hardworking Admin Team, has passed her ten years with Golden Coast and is a specialist in the financial side of the company with a crucial responsibility for the Purchase Ledger. Working tirelessly on setting out to get the job done, Lynne’s commitment has really shone throughout the years. Also reaching her decade with Golden Coast is Office Manager Emma Robinson. She puts her exceptional organisational skills to good use, ensuring her growing team of administrative staff offer colleagues and customers a first-class service. A key player in the Warehouse and Distribution team at Golden Coast, Andy Raymont has been working as a Supervisor for 10 years. He has specific responsibility for overseeing the day-to-day despatch of the increasing number of customer orders processed through the business. Golden Coast Managing Director Jamie Adams, pictured third from the left during the long service presentation to Lynne, Sarah, Emma and Andy,revealed that it has been an honour to work with the four long-service award recipients and highlighted that their efforts have helped the company to achieve success during the past decade. 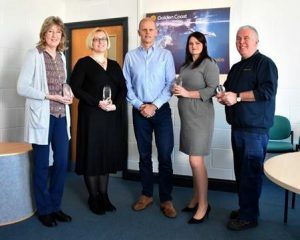 “We enjoy rewarding our staff for their commitment towards the company and it’s great to see four members achieve this award in the same year,” said Jamie; “That is certainly something to celebrate. Register now for SPATEX at www.spatex.co.uk. For stand bookings for SPATEX contact the SPATEX team via email: michele@spatex.co.uk or helen@spatex.co.uk or directly by telephone on: +44 (0) 1264 358558.